Residents of a Shannon Lake neighbourhood are fed up with a lack of police attention on a persistent problem. “Once a month we’re getting broken into,” said Mike Young, a resident of Shannon Way, a street that’s being hard hit by a prowler. Without other options, Young decided to cast some light on the issue. This weekend he posted several clips of surveillance footage his neighbour took on his Facebook account and already it’s had more than 1,200 shares and 60,000 views. 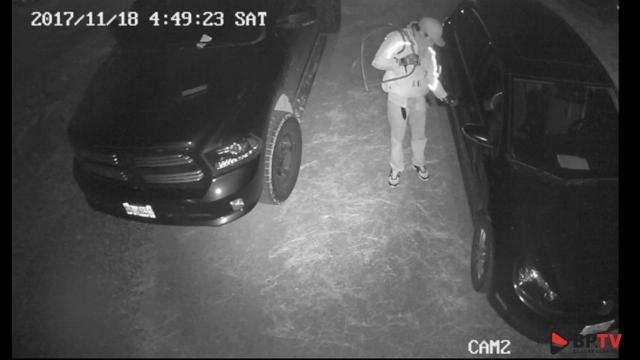 “My truck and my neighbour’s truck, both got broken into and several thousand dollars worth of tools were stolen,” he said. Young has turned the video footage over to police and all the tips that have come in from the video post. He said several people claim to know who the prowler is. Until something comes of it, however, Young said he fears he and his neighbours will just have to wait for the next break in because there’s no other way to deal with the monthly occurrence.